The Giemme System offers different solutions for the floor guide rail, each one having different characteristics. 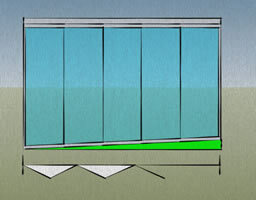 It’s even possible to have the folding glass doors without a floor guide rail. For internal partitions, shop window displays and where it isn’t possible to recess the floor guide rail, the Giemme System can be applied without any guide rail at all. This is because the Giemme System is completely suspended so there is no need for supports or bearings that slide on the floor. 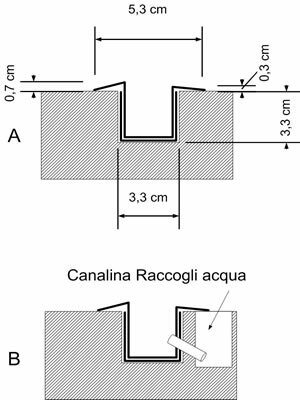 The installation of the option without a floor guide rail is subject to the following conditions: the glass doors must be composed of at maximum 4 panels (a total of 8 including both sides) the maximum width is about 5.50m (folding up at both sides). A classic solution available without floor guide rail: hinged entrance door with 4 panels. Width is around 4000mm. The recessed guide rail (figure A) is an excellent option. Thanks to a little crack in the floor, the Giemme System can be applied to a horizontal space of any dimension. Some good examples include restaurants and hotels where the productions often exceed 10 metres. The recessing can be done on already existing flooring with a simple groove. 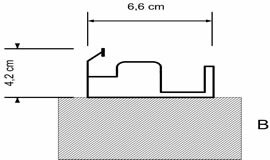 In addition you can install a small drain (figure B). In situations where there is or it isn't possible to use a recessed floor guide rail. On balconies, in all situations where there is no to and fro and it isn’t possible to use a recessed floor guide rail, we have the choice of 2 different types of external floor guide rail. 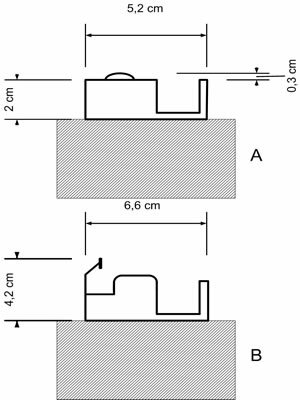 The first (figure A) has an external fixture but is only 2cm high. The second (figure B) has a break system that ensures full protection. * Note that removal cannot be carried out on a daily basis it is intended more as a seasonal occurrence. Once removed a space remains underneath where the floor guide rail was fixed. .
Bolts, locks and retractable wells. 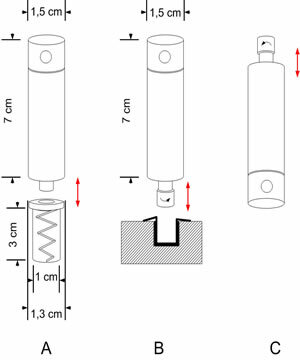 With or without a floor rail guide, the Giemme System can be closed thanks to a system of bolts with pins that are inserted into the track above (figure C), into the floor rail guide below (figure B) or in wells with a retractable spring in the absence of a floor rail guide. Thanks to the pivot pin in B and C, the Giemme System can glide horizontally even when the bolts are closed. This fixing system ensures excellent grip and stability and in impact tests the Giemme System obtained the highest safety classification (UNI EN 13451-1). When there is an entrance door used, closure will be instead via a lock. Glass doors shaped at the bottom. Adapts to sloping ground.